After graduating from Nanakuli High & Intermediate School, William Kaeo III received his Associate of Science in Natural Science: Pre Engineering at Kapi‘olani Community College (KCC). At KCC, William participated in and became a peer mentor for the KCC STEM program. William is a member of the Engineers for a Sustainable World, University of Hawai‘i branch and participated in building the club’s solar cart for Earth Day. For the upcoming Fall 2015 semester, William will transfer to the University of Hawai‘i at Ma?noa, where he will be pursuing a Bachelor of Science degree in Mechanical Engineering. At the University of Hawai‘i at M Mechanical Engineering and to work in the aerospace or automotive industry. In his free time, William enjoys spending time with his family, stand up paddling, playing with his dogs, and working on cars with a? noa, he hopes to obtain a master’s degree in his father. Project Abstract: The Canada France Hawai‘i Telescope (CFHT) has been in operation since 1979 and is currently investigating upgrading its optics and dome enclosure from a 3.6-meter optical/infrared telescope to a 10-meter class telescope. 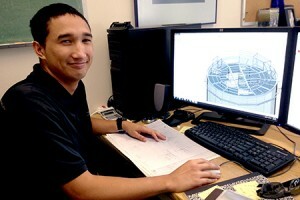 An accurate computer automated drawing in SolidWorks of the lower cement and steel structure of the current CFHT observatory is needed as the foundation for all future engineering work. The purpose of this project was to create an accurate model of the existing observatory building and its features for the engineers working on the new remodeled design of the CFHT to give a greater idea of new instrument fitment and possible design constraints as well as a model on which to base FEA studies. An accurate model of the observatory was created by converting a current semi-complete Autodesk Inventor model into SolidWorks and matching it to the existing architectural drawings along with measurements taken from the as-built structure. Because some of the features that exist in the current observatory building do not match the architectural drawing, many of them needed to be checked and documented in-person on the summit in order to ensure an accurate representation of the observatory building. This model will be used as the core structural component in the final design of the Mauna Kea Spectroscopic Explorer, which will be a 10-meter class telescope designed to take around 7 million spectra each year to excel at galactic archaeology of the Milky Way.